In this chapter, you will find a wealth of materials to help you actively engage your trainees in critically examining Open Science issues. We recommend you approach all of these materials with the motto "Adopt, adapt, develop" in mind—meaning that its best to re-use what exists where possible. Hence, before you start developing training resources from scratch you should find out whether there are existing resources you may use. We give some example resources here, with tips for how they could be adapted for your purposes. We also provide links and strategies to help you find further material. In some cases, existing resources may be used as they are, so you may simply adopt them. An example at stake may be an openly available video tutorial about open file formats which you may point your audience to. In other cases, you may have to adapt existing resources somewhat in order to make them fit your purposes. For example, you may need to add/replace some institution- or country-specific references to an existing overview of Open Access requirements issued by research funders. Only as a last resort you should develop your own training resources from scratch. If you want to develop your own training materials, be sure to develop Open Educational Resources so that other trainers can reuse and adapt your materials. The Open Science Network Göttingen, a group of researchers and librarians who support open science practices and knowledge exchange regularly organize these meet-up events where various open science related topics are discussed. The network unites people interested in Open Science topics at the Göttingen Campus and is open to everyone. They have become quite popular attracting scholars from different disciplines who are eager to discuss their experiences with open scholarship and to learn about new methods, tools, and practices. Invited speakers usually introduce the topics which is followed by small group discussions with a more in-depth view on related issues. The aim of the workshop is to provide researchers and administrators with hands-on examples of Open Science tools and workflow examples across various disciplines, and to start applying and discussing these. 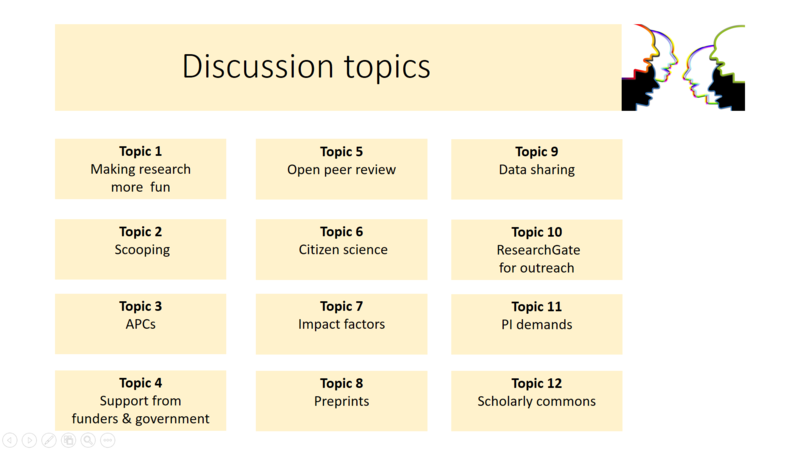 For this, we present an overview of Open Science practices and tools that are used throughout the scientific workflow, with practical examples, audience polling and interactive discussions. The second day is oriented at application and sharing. In various rounds participants explore and where possible try out or apply tools and practices. They do this in small groups and individually and also in a lively marketplace. In a final session we have a discussion on obstacles and incentives for switching to open science in your own research. A Carpentry workshop is a hands-on two-day event that covers the core skills needed to be productive in a small research team. Short tutorials alternate with practical exercises, and all instruction is done via live coding. Software Carpentry was founded in 1998 and Data Carpentry was founded in 2013. Both focus on computational skills, run two-day workshops taught by volunteer instructors, and strive to fill gaps in current training for researchers. However, they differ in their content and intended audience. Data Carpentry workshops focus on best practices surrounding data. Its learners are not people who want to learn about coding, but rather those who have a lot of data and don’t know what to do with it. Data Carpentry workshops are aimed at pure novices, are domain-specific, and present a full curriculum centered around a single data set. Software Carpentry workshops are intended for people who need to program more effectively to solve their computational challenges, are not domain-specific, and are modular—each Software Carpentry lesson is standalone. EIFL organized a train-the-trainers program for five universities in EIFL partner countries (Ethiopia, Ghana, Zimbabwe, Tanzania, and Nepal) that have committed to integrating open access, open science and open research data into courses for PhD students. Day 1 covered open access and open data. Day 2 and 3 were dedicated to open science across the research workflow, including current practices at participant’s universities. On Day 4, participants designed and prepared their own training program. 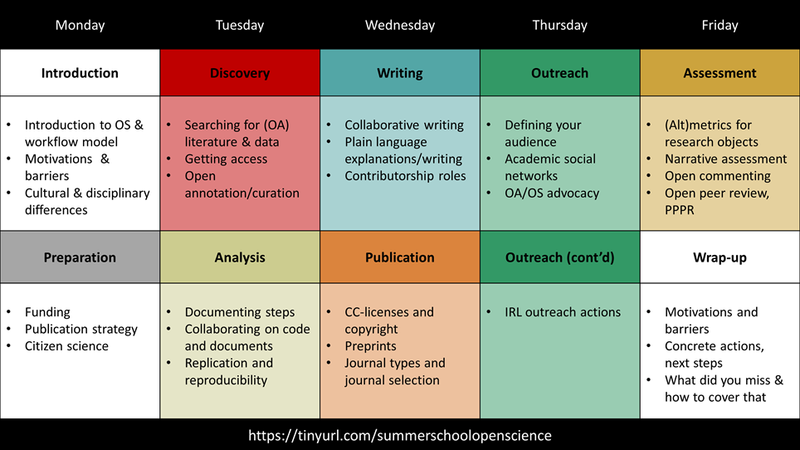 Various universities across Europe organize weeklong summer schools on open science, primarily aimed at early career researchers. These events cover a variety of topics in five days, usually with many hands-on activities to apply open science into daily practice. Use this Google form to suggest additional exercises! Imaginary line in the room forms a spectrum between ‘strongly agree’ and ‘strongly disagree’. One participant, or the moderator, makes a statement (can be on topic ‘closed data should not be cited’ or off-topic ‘leggings are not trousers’. All participants have to position themselves along the imaginary line. The moderator asks some participants to explain their (literal) standpoint. Make sure not only the opinionated people are talking. Ask people who linger in the middle to explain their point of view. 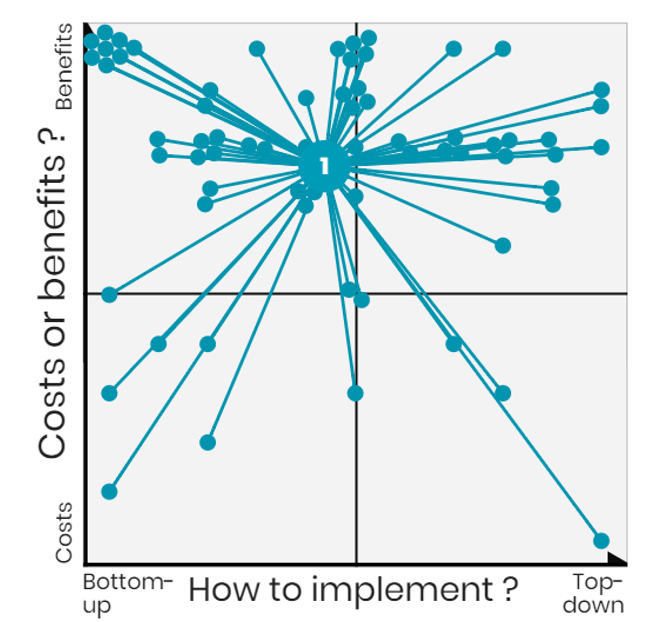 Identify knowledge gaps / areas participants feel they would most benefit from training in. (optional) Identify areas participants feel knowledgeable about (and can thus share their own knowledge). 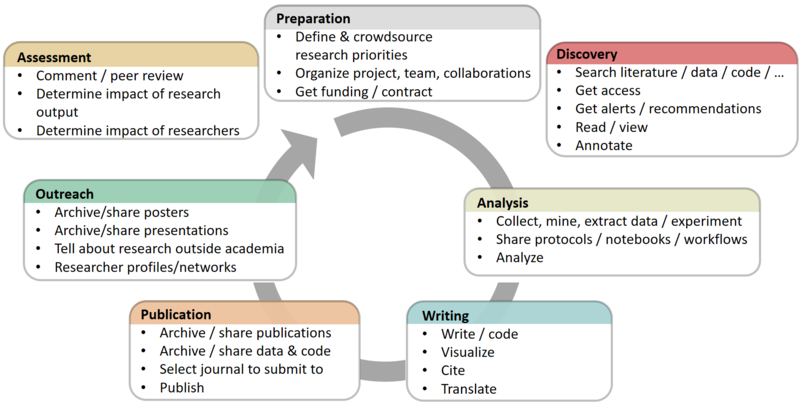 Briefly introducing the research cycle and activities therein. Ask participants to individually identify two to three activities they would most benefit getting training in (in relation to open science). Optionally, also ask participants which two to three areas they already feel knowledgeable about (again, in relation to open science). On individual printouts, participants add sticky dots for each question. Participants then add similar sticky dots to the communal printout. Discuss the results with the full group. Make sure people when seeing the dots also realize there may be a big opportunity for learning from other participants. None; some familiarity with the research cycle is helpful. Best at the beginning of a longer training program where multiple topics will be covered. For the sticky dots, choose a combination that is colour-blind friendly. The number of activities to choose depends on the number of participants (e.g., three for smaller groups, two for larger groups). Individual printouts are used to prevent peer pressure / bias. Individual printouts can be kept for reference during the remaining of the training. This exercise can easily be adapted to prioritize other topics. 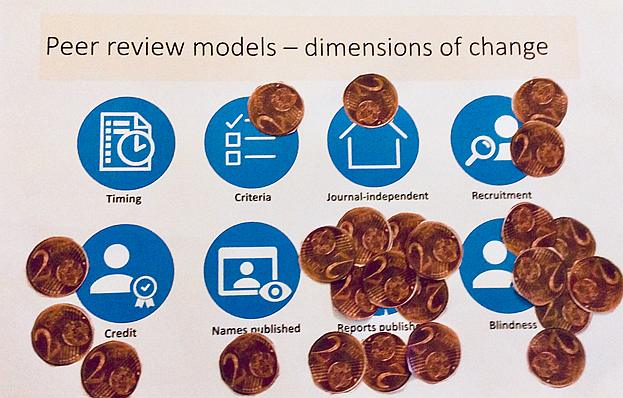 See the spectrum of open science practices across the full research workflow. Assess which practices would the most feasible and effective to focus on. Prior to the exercise, sort the cards according to research phase/activity and spread them across the room (e.g., on tables, or on a large section of the floor). Mark a large section of a wall (windows or pinboards can also be used) with the different phases of the research cycle (e.g., preparation, discovery, analysis, writing, publication, outreach, assessment). Ask participants to select practices they feel are really important for open science, and hang them on the wall, grouped by research phase. Encourage people to add research practices that are not included in the cards. Divide participants in seven groups. Each group looks at the selected practices for one research phase, and chooses the two practices that they feel are most feasible to implement and most effective to make research more open. Either move these cards higher up on the wall, or remove the other cards. The small groups explain their choice to all participants. 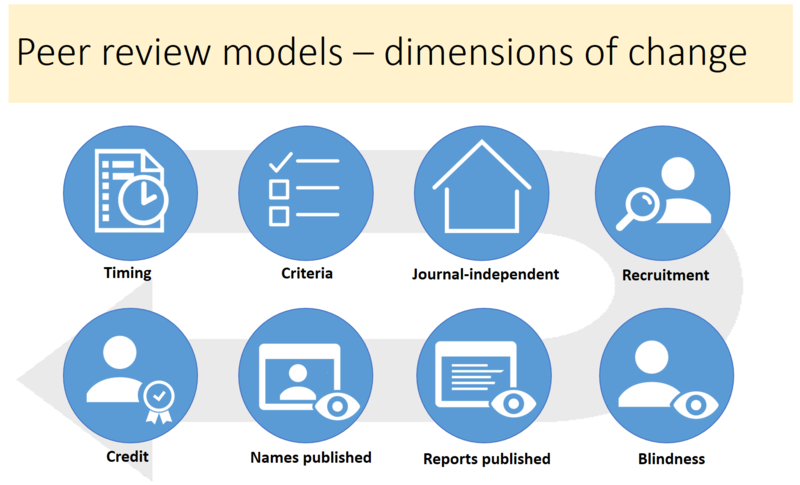 Together, the selected research practices can form a blueprint of an open science workflow. Depending on the number of participants, small groups can prioritize practices for more than one research phase. The whole group may not agree with the small group’s selection of practices for a given research phase. Decide beforehand whether to stick with the choices made, or whether there is room for discussion and consensus-based swapping of practices. The exercise could be modified to focus on specific activities / a specific phase of the research cycle (e.g., publication or assessment). Other selection criteria could be used, e.g. practices participants use themselves, or practices that would be most ideal (independent of feasibility/efforts needed). Confront own experiences and opinions on open science with perspectives from others. Divide participants in groups of four or five and distribute discussion topics (e.g., printed out on paper). Have groups discuss the topics from participants’ own perspectives. (optional) Have each group summarize most important points that came up for the whole group . "Working in an Open Science manner makes research more fun"
"Scooping is a real and existing problem that makes Open Science a hard choice"
"APCs (article processing charges) are the main obstacle to publishing more in Open Access"
"We need more explicit support for Open Science from funders and the government"
"Engaging in open peer review is problematic for young researchers that want to make a career"
"We should take citizen scientists more seriously, and also not just see them as data suppliers"
"Impact factors are a symptom and not the cause of the publishing rat-race"
"There is absolutely no reason we should not publish a paper as a preprint as soon as it is ready"
"Just sharing our data is fine, but to speed up science we need to also work on interoperability and reusability of those data"
"Sharing ideas and projects through ResearchGate is a good way of doing outreach for our research"
"Demands of our PIs are probably the main reason why young researchers do not engage more in Open Science"
"We should strive to create a kind of ‘commons’ where we share all our research outcomes/objects to foster collaboration and reuse"
Some familiarity with the research system. This exercise is best suited to researchers (rather than support people), because they can directly relate to their own situation and speak from their own experience . By changing the discussion statements, this exercise can be adapted to other topics. Have knowledge of different aspects of open science. Connect different stakeholders to discuss statements and topics. The set-up: 6-8 people gather around a table with 1 moderator and 1 note taker. To initiate conversations, they are provided with a deck of cards with statements and questions related to open science and the involved projects. These statements serve as conversation starters. Someone can pick a card, the group talks about it for some time, and then they can move on to the next card. In this way, people learn from each other and start to think about the bigger picture. Meanwhile, you can collect valuable input from different stakeholders. After 20-30 minutes, have the group change tables. Moderators and note takers remain seated. At the end, each moderator reports on what has been said by the different groups at their table. Example 6: What is research data for me? Example 7: Why not share data? Get participants thinking about the ethical and practical barriers to data sharing, and to critically examine their beliefs in this area. In pairs or small groups, participants have five minutes to make a list as long as possible of all the reasons why researchers might not wish to share their data. Participants then report back on their reasons, discussing whether these are valid reasons or not, and strategies for how to overcome legitimate concerns. The team with the most reasons listed wins (prize optional). Note taking equipment (pen, paper, or online document); optional: prize. The exercise should be fun, and participants should be encouraged to come up with fun as well as serious examples. Being able to recognize stereotypes that prevent sharing research data and understand the advantages of opening research data. This exercise should be used at the beginning of the training event. Participants split at least in two groups or more (depends on the group size). A trainer takes care that one group will develop pro and the other contra arguments. In small groups participants discuss excuses already defined at the "Open Data Excuse" Bingo, these are common arguments used by researchers when explaining why they can&apos;t share their data. For the last 10 minutes the groups should confront their arguments. A trainer helps participants to develop arguments for open their data and to better understand the idea of sharing their data. The participants should have experience with creating/collecting research data. Go around and try to help with arguments if needed, especially in the group, which supposed to develop strong arguments for sharing data. Extra help might be needed for these participants to be stronger later in the confrontation with participants from the other group. Participants are asked to think about the last scientific work done in relation with a thesis (Bachelor, Master, or Ph.D.) and to reflect about the kind of data they produced. and finally the type of data, differentiating roughly between O for observations, E for experiments, S for simulations, D for derivations, R for references and D for digitized data, or combinations of them. The group discusses the different clusters and reflects about the requirements for an open data repository or archive. None as long as the exercise is started with some explanations on how to describe and differentiate data. Basic knowledge of research data, repositories, and archives may be helpful. The participants have to find a data repository for their research data. They go to re3data.org and search/browse by subject and/or content type. Let them limit their search to data repositories with DOI assignment. Give them time to have a look at the repository description and let them write down relevant repositories. Afterwards their success and experiences are discussed. 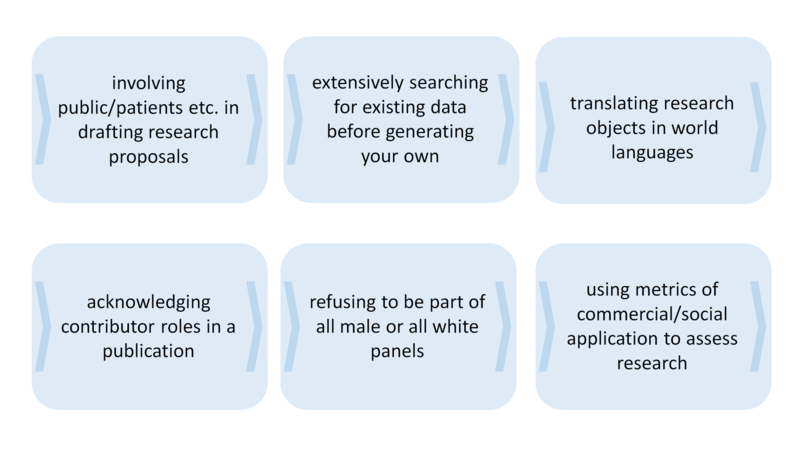 Example 11: What do you need for a data publication? Name as last element "courage"
Let the participants select a file they are currently working on. Let them answer the following questions on a piece of paper: Who created the content? What is the content? When was the content created? How was the content created? Why was the content created? Then discuss with them their results. Was it easy or difficult? Can they repeat this task for all the files in their research process? To make the exercise faster prepare a form and print it out or make it available online. This exercise is meant for any researchers that will use software/code for their research, whether they perform purely computational or experimental work (the latter use software for analysis, etc.). First, have everyone sign up for a free GitHub account if they do not already have one. This free account will be sufficient for working with exclusively open/public code, although you may let them know that students, educators, and researchers can request a waiver for a free professional account. In addition, have participants register for a Zenodo account, and link this to their GitHub account. Next, have everyone create a new public repository, choosing an appropriate license based on the desired permissions (choosealicense.org can be helpful here). On Zenodo, enable the GitHub–Zenodo integration for this repository. Have participants add their source file(s) to the repository, and add some description of the program/script to the README file. Once these files are added, choose a version number and create a release of the software. Head to Zenodo, and obtain the DOI that has been generated for your software. Congratulations, your software is now citeable! You can add a section to the README file with the DOI and suggested citation, or even add the DOI badge that Zenodo provides. Individuals need to have a computer with internet connection. Participants should have some code, script, or program ready—even if it is "messy"—that they will publicly share. Use a (small) computational task relevant to your discipline/background, and establish it as an open and reproducible workflow. Understand the key concepts, tools and services that are useful in the context of reproducibility. Each participant selects a dataset and corresponding data analysis process that is relevant to their field. Both dataset and the analysis process should be short enough that it concludes within a few minutes. Moreover, for the purposes of this exercise, the programming language should be Python or R, but other languages can be accommodated with slight changes in the underlying tools. The participant initially runs the process in the traditional form, and then asks one of the other participants to re-run it with no external help. Identify both the time required for another person to run this, as well as the obstacles encountered. Apply the same process using the Jupyter / Git / MyBinder approach; write the process as a Jupyter notebook, upload dataset and notebook to a repository on GitHub, and then connect the repository to mybinder. After than, ask again the same person to re-run this. Identify the change in time and accessibility. Jupyter and Git are necessary (including an account on GitHub). Depending on the language, additional Jupyter kernels might need to be installed. Finally, the trainer can decide on whether to provide a common example for all participants to use, or ask the participants to bring their own. The difference lies to the amount of time required for preparation, as well as on the uniformity of the participants’ background. The workshop can be performed to different levels of expected prior knowledge, adapting for time. For example, a short basic introduction to Git can be included, but in all cases, the participants should be aware of the computational requirements of their own analysis. The overall concept is straightforward, but has an initial learning curve of the individual components. Therefore you may consider spending some extra time in the beginning discussing each tool, before connecting them all together. You should consider giving the participants a detailed explanation of the installation process (e.g., for Jupyter and Git), before the workshop, in order to minimize potential technical issues. The workshop can be extended to introduce additional concepts of Open Science, such as Persistent Identifiers for software (such as assigning a DOI from Zenodo to the Git repo), as well as integrating all of the aspects under a common platform (such as the OSF). This exercise could be addressed to repository managers. Choose five different publications and ask participants to select which is the version that could be allowed in a repository and which would be the copyright notice they would include: who is the copyright holder and which copyright regime would hold: all rights reserved, a license, public domain. Discuss with them their results and show them the key elements that define the solutions. Individuals/pairs need to have an internet connection to access the papers and check policies. You may provide physical copies of the articles, too. The exercise can be translated to an online version if you prepare a set of polls. Use a range of publications including for instance papers published under hybrid models in order to show participants that is not enough to look up at sites with default self archiving policies. The number of cases will determine the time of the exercise. Can be adapted to training sessions with researchers using their own papers. Let the participants write down on post-its all the file formats they use in their daily work. Then get the post-its and stick them to the whiteboard or flipchart. Try to cluster them as best as you can into categories or groups (text, tabular, statistical, video, image, etc.). Then discuss the results with the audience. Talk about the openness of these file formats and possible alternatives. Prepare for "exotic" file formats that are subject-specific or machine-dependent or let the participants describe them. Being able to differentiate between different Creative Commons licenses and to be able to combine them for works. The participants have to combine two licenses. Let the group guess which Creative Commons license is created by the combination. Repeat the exercise with other combinations. Integrate a combination that is not possible (for example, CC BY-SA and CC BY-NC) and point out pitfalls. Discuss the results with the participants. Wait more than three seconds before taking the answer. This enables participants to think it through and you are able to integrate even weak participants. There is a set of cards marked with a type of content: text, image, music, and video, and each card carries a copyright sign that ranges from all rights reserved to public domain including the set of Creative Commons licenses and the GNU Free Documentation License. One person of the group takes 12 cards and the rest of the group has to combine them building a material with the four type of content: text, image, music and video. Once they choose a right combination they have to decide which is a possible license for this new work. If you use the online version you might do the exercise with all your audience allowing multiple possible answers. Participants work in groups of three. Each participants writes a short text (~300 words) giving their thoughts on open peer review as discussed in the foregoing workshop. They then pass the text to the person on their left, who writes a brief peer review of the work. The text and the review are then passed to the next person on the left, so each now has a text and a review which they did not write. This person then gives feedback on the review—was it constructive, critical, what could have been better, etc. The group then reads all the texts and reflects on how open identities, open reports, etc. affected how they wrote their reviews, and reflects on the critical feedback from the others. None, although the texts will require the knowledge gained in the foregoing workshop. This exercise requires participants to make criticisms of each other’s work—bear in mind that some people might be uncomfortable doing so, or that some may have difficulty accepting such critique. Where these issues occur, encourage participants to discuss them in the final discussion round. Where this example is being used in a training workshop with a wider focus than just open peer review, it could be used to consolidate learning about other Open Science themes by asking participants to first write a text about those themes instead. Instead of pen and paper, this exercise could also be done using a collaborative writing tool, such as Google Docs, Authorea, or Overleaf/ShareLaTeX. Ask participants to individually identify two to three aspects of open peer review they feel would contribute most to open science. In small groups, participants then take the role of reader, author, or reviewer (all should be present in each group). They then discuss one of the aspects of open peer review from the perspective of their taken roles. What are the benefits and potential drawbacks? Small groups then report back to the whole group, and additional perspectives/viewpoints can be discussed. In discussions, it can be hard for people to separate their personal opinion from their assigned role. Encourage and remind people to stick to their role where necessary. Ask participants to express their opinion on two questions about Open Science policies or principles. Results are shown to the group, and the similarity or diversity of responses is discussed, e.g., by asking one respondent from each quadrant to explain their opinion. For individual researchers, does Open Science have more costs or benefits? Should Open Science be organized bottom-up or top-down? If done on paper, it might make sense to have people mark down their answer individually first, before placing their dot on the map. This prevents peer pressure / bias. In small groups of three or four, have one or two person(s) assume the role of open science skeptic and the others the role of open science advocate. After two rounds, gather as a group as share experiences. Which arguments were the hardest to refute? Which arguments worked best to convince the skeptics? Do participants feel these be arguments would be useful in real-life situations as well? Encourage the open science skeptics to get into their role as much as possible. Often, people really enjoy taking on this role! Be sure to switch roles to give everyone the chance to experience this exercise from both perspectives. Create an OSF collaborative environment from data to publication. Connect your OSF project to GitHub. Upload any raw code, images, data, tables to project. Obtain a DOI and ARK identifier for your project. The beta version of the game is licensed under a Creative Commons Attribution-NonCommercial-NoDerivatives 4.0 Licence. The participants understand the basics of open data and reproducible research, understand the stages to setup a research data management plan, and can build their own data repository. A basic knowledge in R, R Studio, and Git would be a plus. He/she may have to put more time in explaining the concept of open data and why people should do it. Most debates occur in this preliminary stage. The exercise is made especially for geo/spatial sciences, but most part of it can used for any science, including citizen science project. Trainers can use this game to facilitate ‘train-the-trainer’ workshops. 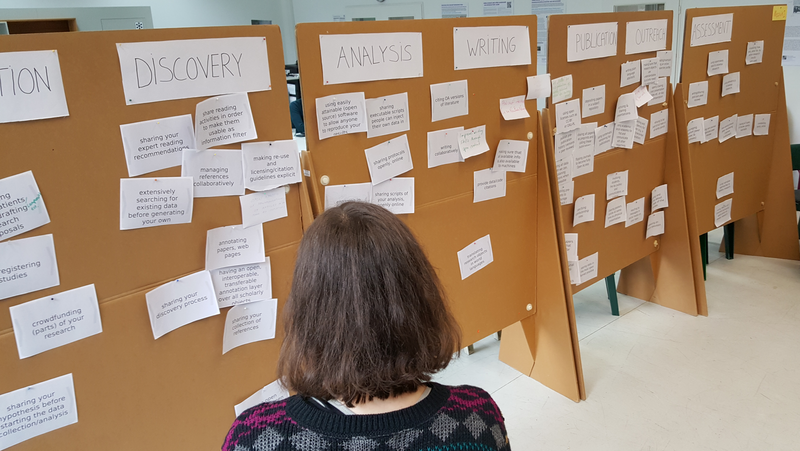 Participants design a usable framework for a training – which will they deliver themselves at a later stage - on (a) topic(s) of their choice. The card game offers the participants the option to preselect audience type, audience size, training type and audience knowledge level. In addition, two ‘unforeseen’ circumstances can be added: audience mood, and ‘trouble’ (uh-oh!). Apart from going home with a usable design for a training, the audience of this workshop will also benefit from the input and experience of the other participants. Extra challenge: How would each group deal with unexpected/unpredictable circumstances during the training? Right before their presentation, each group picks (blind) an &apos;audience mood&apos; card and a &apos;trouble&apos; card and gives them to the moderator, who will either during the presentation or afterwards discuss these cards with the entire group – allowing the audience to learn from the experience of their colleagues. Timekeeping is essential; limit the time people will work on persona&apos;s and training design. Clarify that the presentation should be a description of all the elements of the training they have designed, not actually giving the training. When evaluating with the group, make sure everybody gives input. In principle, all parameters can be adapted and changed to suit a specific training, by creating new cards, new categories, or by removing existing ones. What tools & platforms to use / recommend? There are many tools and platforms that support Open Science practices (see figure below for a selection). Which tools and platforms to use (or advise) depends on many factors, for example: whether the tool is available (either free of at low cost or licensed to your institution), whether it works in your browser or for your operating system, whether it is available in your language, and whether it meets your security and privacy requirements. In addition to these more technical criteria, consider whether a tool fits with the way you work. Does it work well with other tools and platforms that you use? Do the people you collaborate with use the same tool for the same practice, or at least one that is compatible with the one you use? Also consider the learning curve: do you need to invest a lot of time into learning the new tool, and if so, is that worth it for you? Do you have support (either in real life or online) that can help you learn to use the tool? A final remark: many tools and platforms support open science practices without themselves being fully open. For example, many commonly used tools are not open source, even though they provide access to content (publications, data) that are open. You will have to follow your own judgement as to whether you will consider such tools and platforms or not. Another consideration is whether you can export all your data when you’d want to switch to another tool, or whether they are locked in? And do you know what will happen to your data when the platform closes down or is sold to a(nother) company? The conceptualisation of higher complexity subject matter can benefit a lot from visualizing recently acquired knowledge or skills. A great deal of enthusiasm can be raised when simple open source tools are used, individual and collectively. The general name for this set of techniques is idea and concept mapping. A relatively simple software like X-Mind is a good basis to start with. Learner engagement raises sharply as learners understand the power of visualising ideas, connecting them in diagrams, comparing diagrams between learners in the same group, comparing different groups, comparing learners with instructor maps, etc.